Targeted especially towards students who struggle with their core math program, Modern Curriculum Press M Mathematics uses a traditional drill and practice format with a predictable, easy-to-use lesson format that's flexible and adaptable to your schedule and needs. Each two-page lesson focuses on one main objective; the first page begins with a developmental model and the second provides practice. Reinforcing basic math skills, extensive practice will help students learn and retain new concepts while preparing a wide range of ability levels for success on standardized tests. Level E covers adding, subtracting, multiplying, and dividing fractions and decimals; geometry; ratios and percents; graphs, statistics and probability; equations, integers and graphs. 378 indexed pages, softcover. Level E.
The teacher's guide includes reduced student pages which have the correct answers overlaid; the margins feature the lesson and teacher instructions in a two-page layout Objectives, materials needed, warm up exercises, the lesson with provided problems to write on the board, practice exercises, assessments, alternative chapter tests, and enrichment activities for multiple ability-levels are included. 378 two-tone pages, spiral-bound, softcover. 5th Grade. 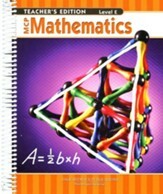 MCP Math Level E / Grade 5 Student Workbook, 2005 Edition, 378 two-tone indexed pages, softcover . 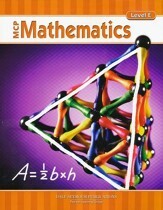 MCP Math Level E / Grade 5 Teacher's Guide, 2005 Edition, 378 pages, spiralbound, softcover. Targeted especially towards students who struggle with their core math program, MCP Mathematics uses a traditional drill and practice format with a predictable, easy-to-use lesson format. MCP Math is flexible and adaptable to fit your schedule and needs. Reinforcing basic math skills, extensive practice will help students learn and retain new concepts while preparing a wide range of ability levels for success on standardized tests. Level E covers adding, subtracting, multiplying, and dividing fractions and decimals; geometry; ratios and percents; graphs, statistics and probability; equations, integers and graphs. 378 indexed pages, softcover. 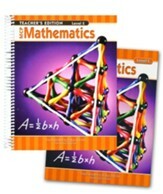 Level E.
Targeted especially towards students who struggle with their core math program, Modern Curriculum Press M Mathematics uses a traditional drill and practice format with a predictable, easy-to-use lesson format that's flexible and adaptable to your schedule and needs. Level E covers adding, subtracting, multiplying, and dividing fractions and decimals; geometry; ratios and percents; graphs, statistics and probability; equations, integers and graphs. The teacher's guide includes reduced student pages which have the correct answers overlaid; the margins feature the lesson and teacher instructions in a two-page layout Objectives, materials needed, warm up exercises, the lesson with provided problems to write on the board, practice exercises, assessments, alternative chapter tests, and enrichment activities for multiple ability-levels are included. 378 two-tone pages, spiral-bound, softcover. 5th Grade.